Welcome to VeinsTreatment.org. It is our mission to help people suffering from Varicose Veins find relief. We have dedicated this site to educating people on Varicose Veins, Spider Veins, and the top treatments. Find information on causes, symptoms, treatments and trends and get a step closer to being free from Varicose Veins. Are you looking for the best Varicose Veins Treatments? Most people who have varicose veins will not experience any symptoms. 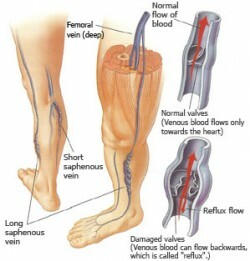 If problems do occur it is often years after the vein(s) have made their first appearance. Varicose is problematic as it causes problems with blood flow. Thrombophlebitis is a condition that develops as veins close to the surface of the skin become red and painful. The surface of the affected area may become tender to touch and warmer than the surrounding skin. Inflammation and blockages in the veins are the reasons that this occurs. It is best when dealing with these symptoms to contact your doctor. Thrombophlebitis is not as big a problem as a blockage of a vein that is deeper in your body, sometimes referred to as DVT (Deep Vein Thrombophlebitis). NSAIDs otherwise known as non-steroidal anti-inflammatory drugs will reduce the inflammation. They will also ease any swelling or pain associated with the area. Individuals that may not be able to benefit from this medication are those with heart, stomach, kidney and asthma. Those experiencing liver problems should also avoid NSAIDs. Children under the age of sixteen should not be given aspirin. Common over the counter analgesics can be very helpful in reducing pain. The word analgesic is from the Greek “an” meaning without and “algos” meaning pain. They work by acting on the central and peripheral nervous system. Anti-coagulants thin the blood, and stop clots from being created. Thrombolytics attack and dissolve any clots that have already formed. Keeping your leg raises will reduce any further swelling. Use moderate heat on the area such as a warm towel or blanket. Do not apply any direct pressure to the limbs as this will cause more swelling. Varicose veins are located on or near the surface of your skin. If you accidently bump into something or the veins get cut it will bleed and you may find it difficult to stop the bleeding. If you experience this problem then the best thing to do is to lay down and raise your leg. Put pressure directly on the wound. If this doesn’t solve the problem contact your doctor. If you are experiencing blood flow problems then it can also be interfering with the method that skin absorbs oxygen, disposes of waste products, and takes in nutrients. If this problem continues for a long period of time then it is called “Chronic Venous Insufficiency.” This will in turn create other issues such as Varicose Eczema. The skin around the affected area will become purple and brown and could remain that way indefinitely. The other problem that might develop is Venous Ulcers. If you have varicose veins and extra pressure is applied to the lower limbs sometimes fluid will leak from your veins and be retained under your skin. In time they will eventually penetrate through the skin surface and become an ulcer. These are extremely unpleasant and require immediate medical attention. It can take several months for an ulcer to completely heal.